margaret ellen turner - painting NOW. Painter Celebrates four decades of art making. Twenty paintings in a series five years in the making, go on exhibition in Painting Space, at Caloundra Regional Gallery, opening Friday 5th April. Turner started her art career as a sculptor in Sydney in the late ‘70’s but somehow over the years began painting, all the while maintaining her fascination with three dimensions and other sculptural themes. In the current work, which emerged following time sketching the escarpments and gorges of the Macdonnell Ranges, near Alice Springs, she brings to the gallery walls ‘that wordless, visceral, even overpowering, encounter with Australia’s ancient and uncompromising landscapes’. Turner can spend up to ten months on an individual painting, patiently building up layer upon layer of mark-making and colour to arrive at an outcome she did not expect. 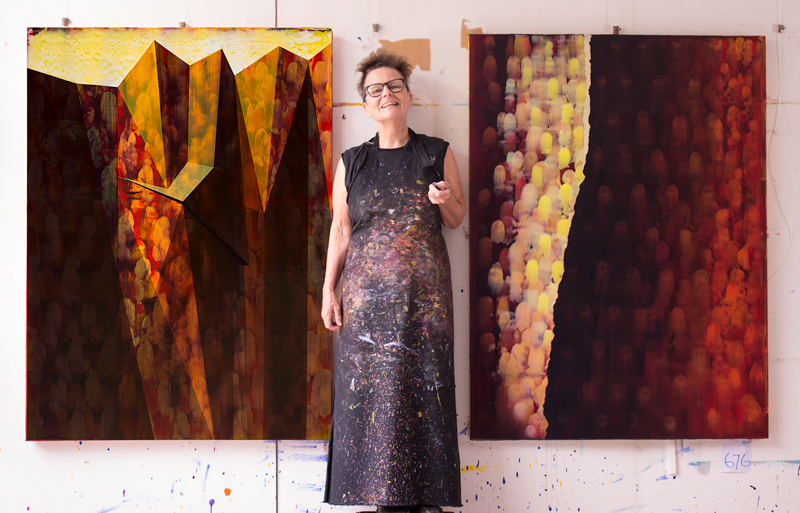 “I just start on the journey with a series of marks and colour on canvas and no expectations. Then I follow along, allowing the serendipity of process to guide me and making decisions of ‘where to next’ as each layer dries. Painting Space also showcases the work of early-career artists Carley Cornelissen, late of Diamond Valley, Robyn Shaw, late of Glass House and Alison Mooney who lives in Tewantin. Don’t miss Gallery 3 in which the artists have compiled videos, artifacts, photographs and notes from their own “painting space” to deepen your experience of this exhibition. Opening Night 5th April is at 6pm. Or explore this site.